One of the highlights of my fall was a tour of San Francisco’s fantastic bookstores, meeting staff and discussing The Haight. Who doesn’t love chatting with people in bookstores? The folks we met in San Francisco were tremendous – warm, engaged, encouraging. The city has its share of legendary bookstores, and I was delighted with how many of them were carrying the The Haight. As I’ve written before, the highlight of the time in San Francisco was my signing at Borderlands Books. Huge thanks to Jude Feldman and her staff for making my wife Carol and me feel so at home in the store. And thanks for stocking so many signed copies of the novel. In Book Passage, I got to tell the staff that my hero, Lieut. Jimmy Spracklin, lives in Sausalito, with the hopes that they’ll stock the book at the Ferry Terminal and Marin County outlets. I missed the poetry reading (first and third Mondays of every month) at Bird and Beckett, but hope to catch it next time. At least I had a chance to stop by and say hello. We stopped by the legendary City Lights bookstore, hopped across the street to the Beat Museum and then had a pint at Vesuvio Café. I knew that Booksmith on Haight Street had stocked a few copies of The Haight. I was delighted to visit on a Monday to see they were down to one copy of the book, which had been sold by the time I visited again on the Saturday. It’s great to know that Haight-Ashbury will soon have three bookstores – Borderlands, Booksmith and the Bindery. It will add to the buzz on the street. 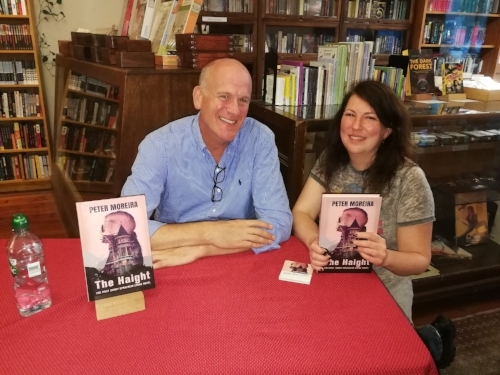 I’ve already started talking about an event on Haight Street in mid-2019, hopefully to promote the second book in The Haight series.